New Gloucester Fire & Rescue Deputy Chief Roger Lavasseur shared concerns about compensation for the mostly volunteer department during a March 5 Selectboard meeting. NEW GLOUCESTER — Debate over compensation for the town’s mostly volunteer fire department, especially in regards to several thousand dollars in officer stipends, has included some simmering discussion at recent meetings. The New Gloucester Selectboard initially voted on March 5 to reduce funding in the proposed budget for volunteer officer stipends by $3,500 – a move that didn’t sit well with members of the NG Fire & Rescue Department. “It’s sad that sometimes it feels like the leadership here in this community, not the fire department, doesn’t care,” said Captain Scott Doyle, who said he’s honored “most days” to serve in the department. Later that night, the board voted 3-2 to accept various funding increases recommended by the town’s budget committee, including that $3,500 be put back into the budget for officer stipends. Town Manager Carrie Castonguay said in an interview this week that the fire & rescue budget she worked on with New Gloucester Fire & Rescue Chief James Ladewig initially had $11,940 for officer stipends. Early in the budget process, the Selectboard then decided to reduce that by $3,500. She emphasized that the Selectboard never specified which positions would see stipend reduction or loss. “Unless I’m completely losing my mind, we only cut dollars, we did not cut positions,” said Selectman Stephen Hathorne at the March 5 board meeting. Selectboard Chairwoman Linda Chase, who serves as a board liaison to the budget committee, spoke about the process during a Feb. 28 budget committee meeting and noted that this was “the hardest” budget that she had worked on. “I know if my house is on fire tomorrow, whether you’re upset with me or not, you’re going to show up and you’re going to put my fire out,” she continued. Chase also became choked up when discussing the tenor of the debate and some comments she said were made online about her. 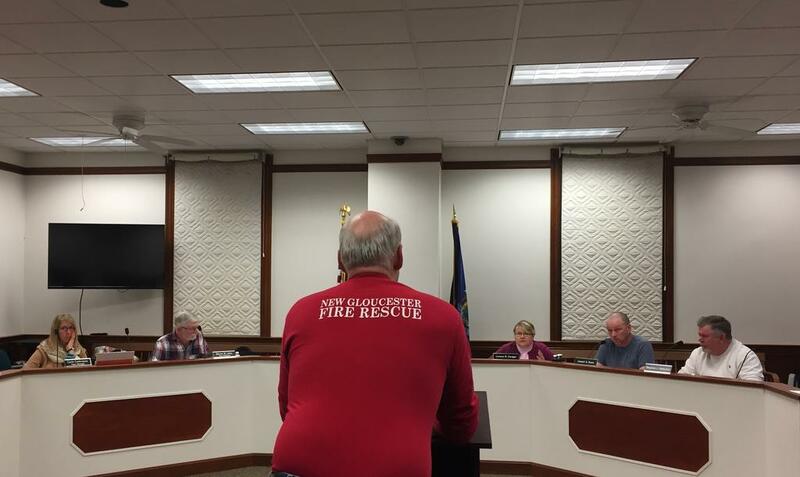 The budget committee had heard concerns from fire department officials during that Feb. 28 budget meeting, which at times became heated between several members of the committee. Ladewig, the fire department’s only full-time staff member, said in an interview last week that the proposed overall stipend funding of nearly $12,000 (which now would include the $3,500) will allow him to maintain eight current volunteer officer stipends: one deputy chief, two captains, two lieutenants, and one safety officer for firefighting, and one deputy chief and one lieutenant for rescue. Ladewig said one additional existing safety officer stipend will still likely be cut as a result, though he expected that individual to continue in their role without the compensation. “I think he understands,” Ladewig said about the officer, declining to identify him at this point except to say that he’s a longtime member of the department. Ladewig said that the rest of the department has been unified behind the officers during the stipend debate. Including the officers, Ladewig said the department has about 40 volunteers. Castonguay said there has been an effort to institute a system where the volunteers are paid per call, with the goal of eventually paying them at an hourly rate without making them full-time employees with salaries or benefits. Deputy Chief Roger Levasseur said that the fire department has been asking for some form of compensation since 2003. “We’re talking [about] a paid department. We’re talking only the times that we need to be there and working or training,” he said, noting nearby towns such as Gray and Raymond have gone beyond that to have more full-time staff. Bill Vickerson, a Portland-based lawyer who serves as the legal and legislative representative for the Maine State Federation of Firefighters, added that departments around the state are having trouble recruiting and retaining volunteers in part because of Maine’s aging population and the amount of training involved.